I keep a candy dish on my desk at work. Sometimes this has disastrous consequences for me, if I'm feeling blue and impulsively decide that a couple pounds of sugar intake will do me good (it never does). But most of the time, I enjoy having it there; People will stop at my desk to pick out some of their favorites and chat for a bit, and always seem to enjoy coming by. Plus, it's helpful to have a candy stash to try to bribe people to help out when you need their aid, but that's a whole different post entirely. Here's a few things I've noticed about the candy dish in the couple years I've been here at my latest job. The top candy choice by far is chocolate, specifically Hershey's kisses. Whenever I bring in a bag of these, they're gone within a couple days. I tend not to stock up on these a whole lot because of the burn-through rate. The least popular choices are sour things like Warheads, Lemonheads, and Sour-Patch kids. There are a few die-hard fans that tend to ONLY pick those, so they're not usually in the dregs of the candy dish, but they definitely don't move that quickly. Other things with a limited audience appeal include individually wrapped bubble gum pieces and lollipops (Blow Pops, etc). 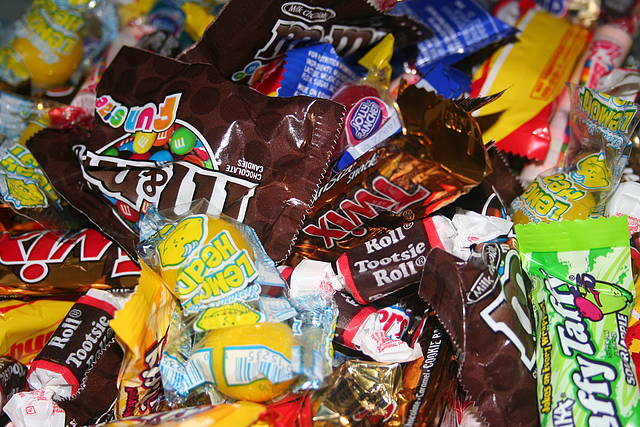 Good middle-ground items include a mix of soft and hard candies such as Werther's Originals, Laffy Taffy, little jawbreakers, Smarties, Sweet Tarts, Tootsie-Rolls (the little ones) and miniature boxes of Nerds. The peak candy time is always right after lunchtime. People must want a sweet snack to finish off their meal. The slowest time of the day is first thing in the morning. I guess people don't want licorice to clash with the taste of their coffee or something. I get a surprising number of folks who come by near the end of the day – I guess they're looking for something to keep them sated on the drive home. I can just hear their mothers saying, "You'll spoil your appetite!" There's no real difference in frequency of visitors by day of the week, except when we have a holiday. The day after a holiday always has more visitors – I'm assuming they need an extra pick-me-up to get over having to be back in the office. Most of the people that come by for candy always seem to be walking on eggshells, practically tip-toeing up to the dish and asking if they can have a piece or two. They select their candy very meticulously and graciously thank me as they walk away. A few people come off as brusque and entitled. They walk up and say, "Let's see what there is today…" More often than not these are the folks that will take multiple pieces of candy. They're always polite enough to thank me as they leave, but it always feels more mechanical than heartfelt. Some people are too shy to hit me up for candy while I'm sitting at my desk. I'll see them ducking out of my cube area with a piece in their hands as I return from a lunchtime run, or a trip to the break room. Candy definitely goes faster when I'm not around. If I'm gone for a week, the dish'll be empty when I get back. If I'm around for the same period of time, people only go through about half as much candy. I guess I must be policing them? There are other folks in the office who have candy at their desks. For some strange reason, their candy always appeals more to me than mine does. I wonder why? For those of you unfamiliar with how to cut trees (yes, there's more than just taking an axe/chainsaw to the bugger! ), one tried-and-true method involves securing the top of the tree with rope/cable so you don't have the sucker crashing down on you or others around you. If you have other trees nearby, you can use one of them as a pulley to keep the tree vertical once you cut the base – otherwise, you secure the line to a nearby heavy object so your tree doesn't fall in a direction you didn't want it to go. In the picture above, they've already looped and secured the line around the tree on the left, and are now pulling it up and around the tree on the right. 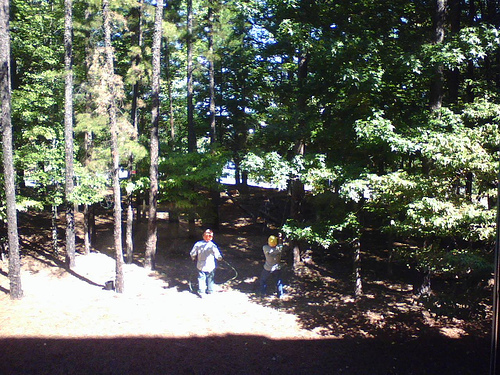 I thought they might have a problem since the loop on the tree they're cutting was taut, but had hooked around a branch so they couldn't tighten it as much as they probably normally would. 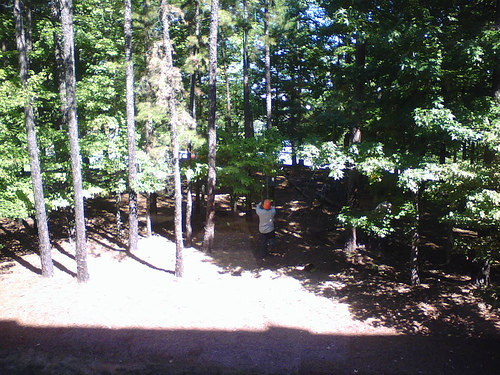 The guy on the left is going to hold the line while the third guy cuts the tree at the base – the intent is to keep the tree vertical after the cut so they can just lop off sections of it until it's so much firewood. Unfortunately, the loop wasn't secure enough…as soon as the guy with the chainsaw had cut through the tree, it started to topple over. 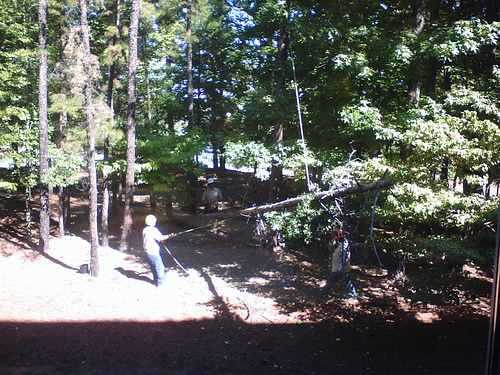 The one tree branch the loop was straining against snapped and while the loop contracted, the tree fell sideways. The guy on the right in the above picture went running pell-mell out of the way to avoid getting brained. As you can see here, the loop finally caught the tree before it went totally horizontal, and the guy on the right is walking back to help out. I think they might have been making fun of him for running away, but heck, if a few hundred pounds of dead wood was about to come crashing down on me, I'd be running too. The crew finished cutting the rest of the dead trees without any more close calls, but it was really hard for me not to keep watching, just in case they had another "incident". I have a feeling this kind of work is more dangerous than it looks, if you're not careful. I'd be interested in seeing what their training and safety guidelines look like. Do You Believe in the Wastebasket Fairy? I believe fairies exist. Or brownies, or some other of their kin. And I think I have proof. You see, I work in an office building, with your typical cube setup, and with typical office regularity, the bathrooms get cleaned, the recycling gets removed, and the wastebaskets get emptied. I'm sure of the first of these because I can hear the cleaning lady knock on the men's room door and ask "Anybody in there?" 2-3 times a day. The big paper recycling bins make a lot of noise when the burly recycling guys roll them down the hall, making it hard to miss when they're hauling them away. However, as for the wastebaskets being emptied…well, I KNOW it happens, but I have just never SEEN it happen. This wouldn't be so unnerving if I simply came in to a clean wastebasket every morning – I'd have to assume that the cleaning staff came by every night after everyone left and emptied the trash. But it doesn't happen that way. Instead, some days the wastebasket will be empty when I come in to work in the morning. On other days, it still retains yesterday's refuse when I arrive. But almost always, sometime during the day (but never while I'm at my desk!) the wastebaskets are emptied and a fresh plastic liner fitted in place of the old one. Again, I'd attribute this to a polite facilities crew, except I NEVER SEE ANYONE walking around the building with anything that they could be dumping my wastebasket into. I don't work a regular schedule where I leave my desk every day from 10:15-10:30 (or the like), and don't see how I wouldn't, at least once, catch a cleaning person lying in wait for me to leave, if they really were trying to avoid interrupting my work. My only explanation? The little folk. Only they could be deft enough to take care of the trash duty right under my nose, or in the few moments I step away from my desk to grab another cup of coffee from the break room. I'd never see them if they didn't want to be seen. It really is the only explanation. My hypothesis seems to be backed up by the fact that when emptied, the wastebasket is never placed back where it was previously sitting. Sometimes it is left behind my desk, sometimes next to it, and once, it was even left underneath my desk. I'm not sure, but I really doubt that the cleaning crew has a playful enough nature here at the office to want to do such a thing every day for months on end. Regardless, my wastebasket fairy always does a top-notch job and never misses picking up any scrap of paper that might have missed the bin. I'm highly appreciative, but have never been able to show it. So this weekend, I think I'll leave out a saucer of milk. You know….just in case. 1) He doesn't like apples and someone (possibly his second mental persona) is packing them in his lunch each day. He doesn't have the heart to throw them away or give them away though, and so keeps them on his desk along with those Christmas cards from 6 years ago and that one little stuffed animal he won at the carnival when he was a teenager. 2) He is an evil genius and is developing a diabolical plan to breed mutant, sentient apple-pudding-cups as soon as he reaches a critical mass of apples and pudding cups (so far the pudding cup count remains constant at two). He is hampered in his grandiose schemes by a federal regulation prohibiting him or anyone he knows from buying apples or pudding cups for him. He has arranged a deal with the Redneck Mafia in which they toss an apple through his open car window on the way to work every day; they are still trying to work out how to throw the pudding cups to him without them bursting. 1. Yum, sardines and chili for lunch again! 2. Yes Mother, I know you wanted that massage, but I'm working late again tonight so it'll have to wait until tomorrow. 3. Well, he said I'm still infectious…but you know doctors – they're always trying to scare you with their medical mumbo-jumbo. 4. I wonder how long it would take the police to respond if I just starting shooting people? 5. Hey, I think one of my toenail clippings flew over the cube wall…could you throw that away for me please?